I can tell you one thing- this is going to be a lot of work! Everything here is homemade, from the scratch. At the beginning this was going to be a duck ragout, because we have it a lot in our favorite Italian restaurant. However, when we were planning on buying duck, my boyfriend’s dad said ” why don’t you go for guinea fowl? ?” And I was thinking, OK let’s try it out. I have to say, it was a great idea. We love duck, don’t get me wrong, but guinea fowl is delicious. Its meat is delicate and there is very little fat on it. 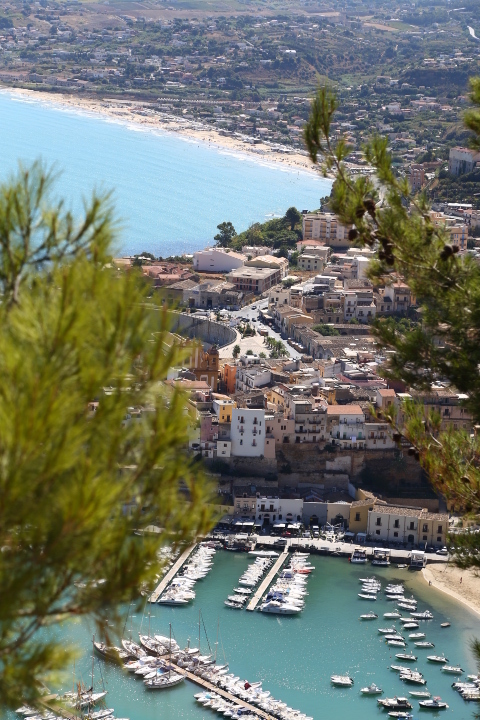 We love the taste of this ragout, especially with home made pasta. 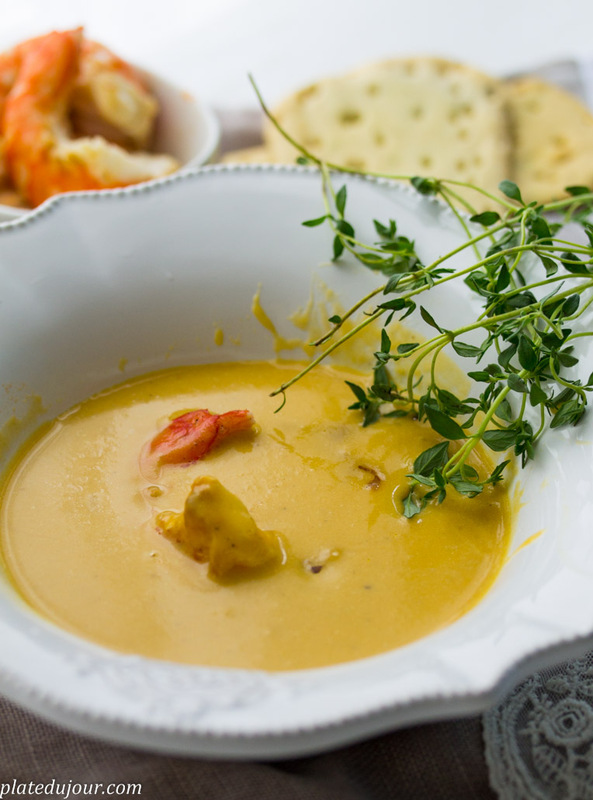 In order to make this dish, make sure you have time, and it’s really for a special occasion. I divided this post into two parts. The first one will explain how to make pasta. You can use this recipe for any type of pasta you wish to prepare. 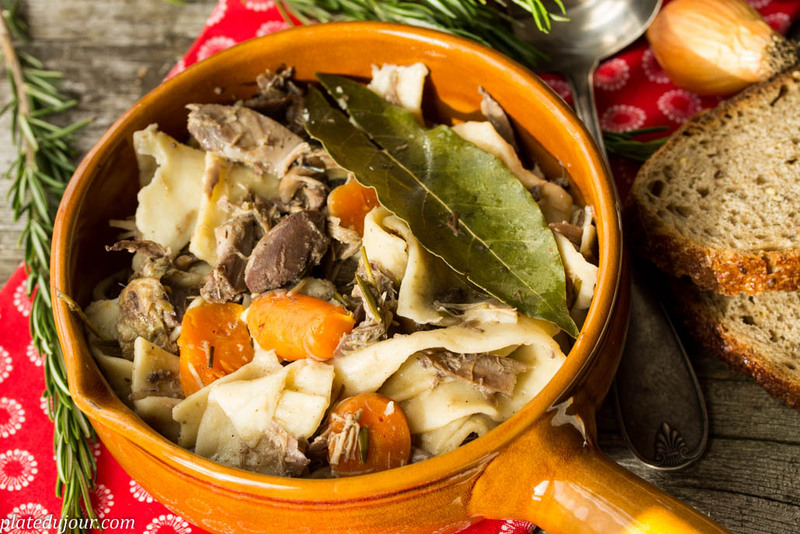 The second part is dedicated to the ragout recipe. I hope you will enjoy it, especially the pasta stage if you haven’t done it before. This is a lot of fun to have in the kitchen. 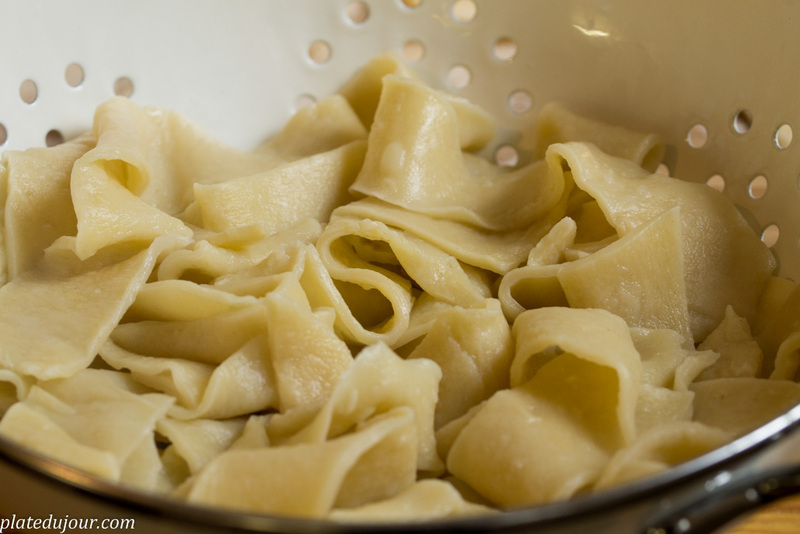 Homemade pasta is not that difficult to make once you have a bit of practice. 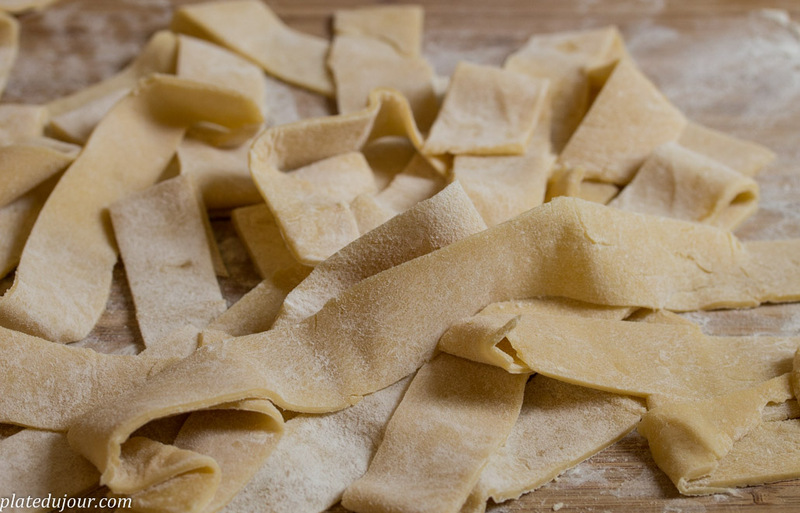 To be honest certain types, like fettuccine, ravioli, gnocchi or pappardelle taste much better if made at home. My mom told me once what the main difference between the dumplings and pasta dough is. It’s simply the temperature of water you use to make it. For dumplings the water has to be very hot, where for the pasta the water needs to be only warm. Also it is important that you knead the dough as long as it is required, until it’s smooth and elastic. Remember that in general, once the pasta is ready you should leave it for a while, so the dough could “rest”- usually 1.5- 2 hours is enough. Cooking time is different as well. 4-5 minutes in a boiling and salty water should be enough- don’t forget to try it of course before straining. On a work surface sift the flour and make a well in the middle. 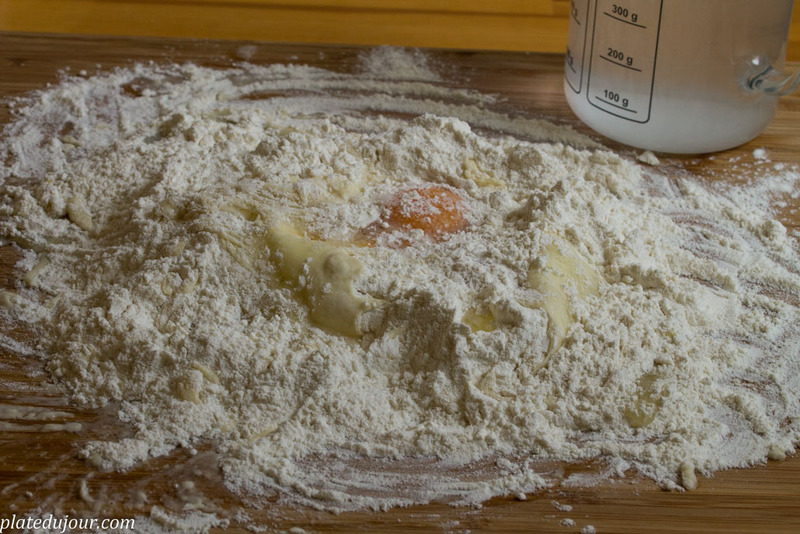 Place the eggs and the salt in a well and start gradually mix all the ingredients. Pour some water from time to time and keep mixing until all ingredients are well combined. Once the dough is ready for kneading divide it into two equal size balls and flour the work surface. Knead each piece of the dough by hand. Push the dough away from you with the heel of your hand, fold the dough over itself and turn it counterclockwise. 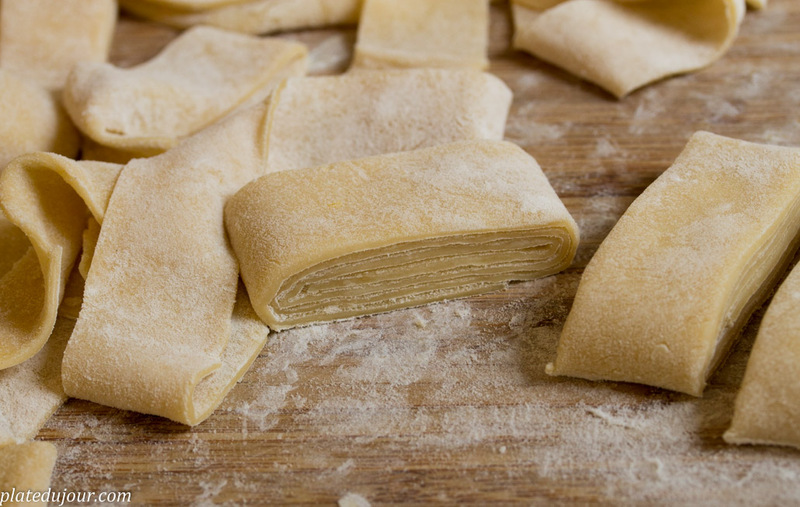 Continue doing the same- pushing, folding, and turning until the dough is smooth and of elastic consistency. Once ready, flour the work surface and start spreading the dough with a rolling pin. Roll the dough into a sheet, turning from time to time. Continue to do so until you can almost see your fingers through the bottom. Let dry for about 2 hours. 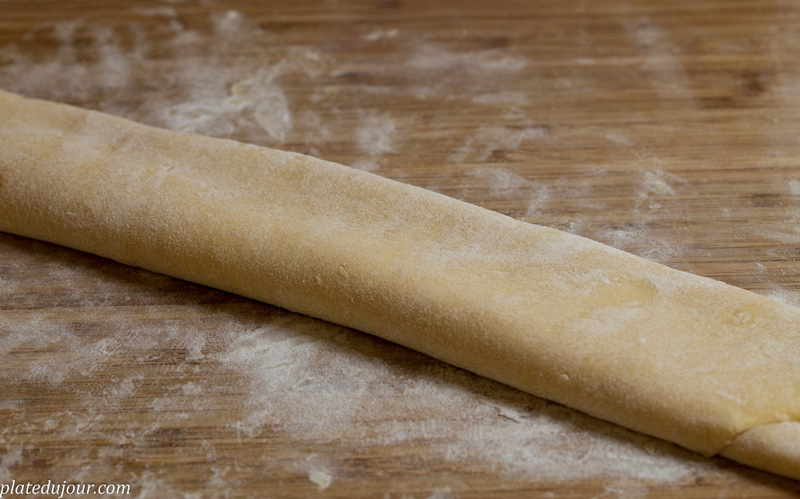 Once the dough is dry enough, dust the sheet with some flour and slowly roll it into a cylinder. Using a sharp knife, cut into 2-2.5 cm wide slices. 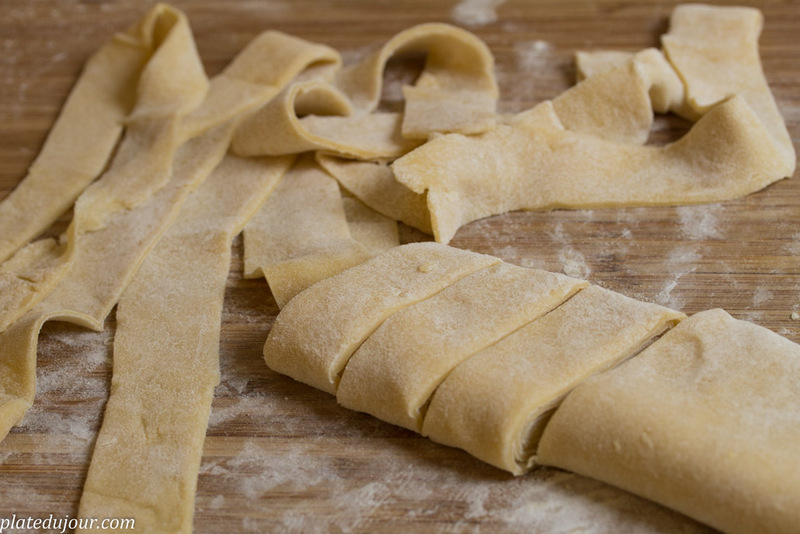 Unwrap the pappardelle, dust with some flour and slowly separate them. Place the pasta on a separate surface. Cook in salty, boiling water for about 4-5 minutes. In advance- and you can do it before you start making the pasta- prepare the meat. Wash the legs and cut them in half. Prepare marinade- in a glass bowl 4-5 table spoons of extra virgin oil, half a glass of wine, 3 cloves of garlic- dice them in very small pieces, salt, white pepper, and diced thyme. Combine all the ingredients and place the meat in the bowl. Let the meat marinade for about 30-40 min. Once the meat is marinaded properly fry it in a big sauce pan until the skin gets golden and kind of crunchy. It took me about 10-15 minutes, but it depends on the sauce pan you use. On the picture below you can see how the meat changes gradually with time- until the desired stage. Now you can place the meat in a bigger sauce pan, add diced onions and dried mushrooms and pour some wine too. Stew the meat for about 1.5 hour. Remember to pour more wine occasionally, or add some water if the sauce reduces too quickly. Also there is no harm trying it and maybe adding some more salt or white pepper- seasoning depends on you totally. When the meat gets really tender take it out from the sauce pan and leave aside for a few minutes. In the meantime add diced carrots, pour more wine and add some water again. Let the sauce simmer. Now you have to separate the meat from the bones and slice the meat in smaller pieces if necessary. When this is done, add the meat to the sauce again and stew slowly for another 30-40 min, until the carrots get soft. As a last thing you can add a table spoon or even two of thick cream, but it’s not necessary if you don’t like cream in the sauce. When the ragout is ready, combine it with pappardelle and serve hot. It’s excellent with red wine. Enjoy!